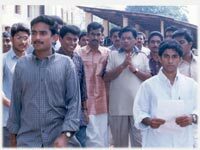 ...Another memorable event is my degree life was the 50th Anniversary Celebration of our college. 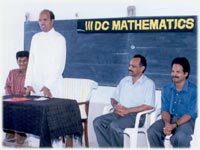 We conducted a Maths exhibition and a Magic Show. It is now a sweet feeling to remember those days and the event when I too dared to show some tricks on the stage. 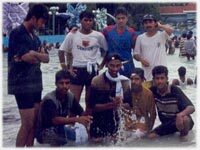 I am sure that no one in our class would ever forgot out the study tour to Ootty, kodaikanal… The trip was very much soothing and we had a nice time to interact with each other and to become intimate. We would never be able to forget MR. ChandraMohan sir who extended his all hearted cooperation and made himself one among us and thus made the trip in memorable. At this moment, I would like to express my deep sense of respect and gratitude to all my H.O.D Prof. P.J. Micheal sir and all staff members of both Mathematics & Statistics departments for being inspiration and providing me with the light of knowledge with which I could achieve my career goals and be a useful co-being for the society. Dear friends, even though, I’m unable to mention each and everyone of you and the sweet moments I had with you, within the limitations of a web page, in the deepest valley of my mind, your memories are still alive as the true definition and the exact phrase withwhich I defined the term ‘FRIENDSHIP’.